The Owczarek Podhalanski, also known as the Polish Tatra Sheepdog, originated in the Podhale, a small, mountainous region in southern Poland. Developed as a livestock guardian, the breed is also used for personal protection, as guard dogs for private property, for military and police work, carting, and as guide dogs. 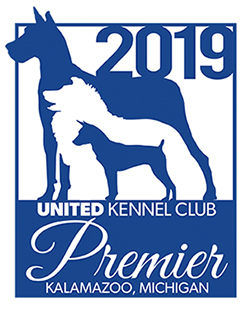 The Owczarek Podhalanski was recognized by the United Kennel Club on January 1, 1995. 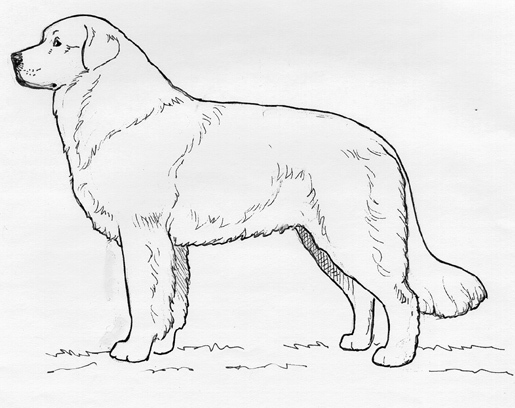 The Owczarek Podhalanski is a strong and compactly built dog, with a rectangular shape. Its body is impressive, expressing both power and mobility. Its temperament is calm and grave. The breed is intelligent and alert. Its imposing attitude makes it an attractive companion dog. The head is lean and in proportion to the body. It is held at medium height both during movement and in a standing position. In profile, the skull is slightly domed. The forehead furrow is shallow. The stop is distinct, but not abrupt. The strong muzzle tapers slightly. It is slightly longer than, or equal in length to the length of the skull. The top of the muzzle is broad. The tight lips have dark rims. Faults: A deep forehead furrow; poor pigmentation of the lips. A full complement of strong, white teeth meet in a scissors bite, which is preferred. A level bite is acceptable. Disqualifications: Several missing teeth; overshot or undershot bite. The expressive, medium size eyes slant slightly. They are dark brown in color. The eye rims are dark. Faults: Light, bear eyes; poor pigmentation of the eye rims. The nose is black. Nostrils are wide. The ears are set at the same height, or a little higher, as the external angle of the eyes. They are medium length, rather thick, triangular in shape, and densely coated. The front edges lie close to the head. Faults: High set ears; ears bent back; cropped ears. The medium-length neck is muscular, without any dewlap. It has a profuse mane. The upper line of the neck is higher than the back. The shoulder blades slope slightly. The muscular, well-boned forelegs have plenty of bone, but are not too heavy. They are straight when viewed from the front. The pasterns slope slightly. The body is long and massive. The broad withers are distinctly marked. The back is level and broad. The loins are broad. The croup slopes slightly. The chest is deep. The ribs are oblique and rather flat. The tuck-up is slight. Fault: High at the croup. The hindquarters are moderately angulated. Viewed from the rear, the hind legs are vertical. The rear pastern is straight. The large front and hind feet are compact and oval in shape. There is hair between the toes. The pads are strong, hard, and dark. The nails are strong and blunt. Dark nails are preferred. The tail set is not very high, following the slope of the croup. It is held below the level of the back. When the dog is excited, it may be held above the level of the back, but is not rolled. In length, it reaches to the hock. The tip of the tail may be a little curved. Fault: Tail held constantly over the back. The hair is short and close on the head, muzzle, the front of the forelegs, and below the hock. The neck and body are covered with a long, thick, straight, or slightly waved hair that is hard to the touch. There is a profuse undercoat. The neck has a profuse ruff. The thighs and tail are covered with long, thick hair. Faults: Lack of ruff; lack of feathering on the legs; lack of hair between the toes. Disqualifications: A curly coat; a silky coat; lack of undercoat. A uniform white is the acceptable color. Small cream-colored patches are undesirable. The height range, measured at the shoulders, for males is from 25½ to 27½ inches. The height range, measured at the shoulders, for females is from 23½ to 25½ inches.